In the UK Local Authorities have a statutory responsibility for the management of local air quality. Many guidelines and tools have been developed to promote best practice in the way these responsibilities are carried out. However, the type and severity of air quality issues varies widely across the UK. IES members working for Local Authorities have expressed concern that air quality is not considered during development planning. In 2013 the IES surveyed UK Local Authorities. This report summarises those responses. 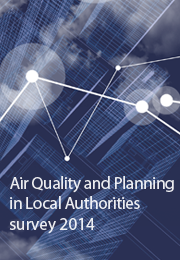 It follows the Air quality and Planning law technical note published by the IES last year.